How long has she been riding? Baby Banks first sat in the sidecar at age 8 weeks old and begin riding shortly there after please read the 13 steps to becoming a Biker Pig! How many miles does she have? Baby Banks is 9 months old and has 825 miles under her hooves. This summer almost every weekend. She will probably only do short rides during the winter to keep her familiar with the motion. Yes, she uses a Batzi Belt restraint system and a pet car seat by Snoozer Products. No, but she has never shown any signs of wanted to not go on the contrary she tries to get into the sidecar herself! How did you train your pig to do that? By not trying, seriously it was a side effect of everything else we did making it possible for her to become a Biker Pet! Check out the 13 steps to success! How do you know she is comfortable with this? Pet body language is an art, some learned from experience with all animals some from the experience of knowing your own animal, some from education in the pet training and safety fields. It also is a balance of listening to your pet verse what you want your pet to do and in this case it was her call. For more clarification you can ask us any particular concern you may have at www.facebook.com/thezenzoo. 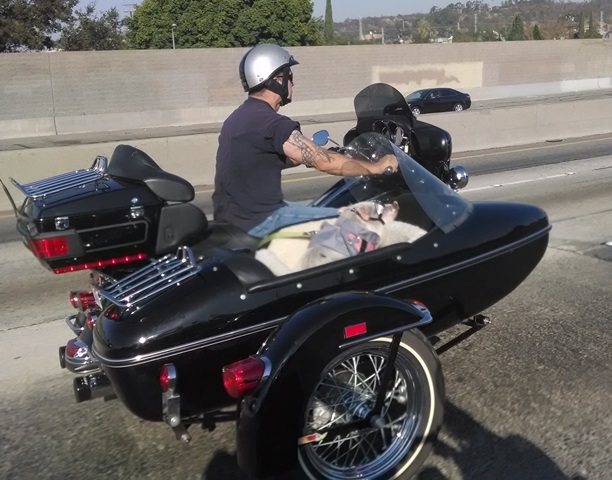 Does Emma Zen get made when your in her sidecar? No, I have my own! See picture below! Disclaimer; It's not for every pet. Most people agree "my dog LOVES to hang his head out the window." But the noise, vibration, weather all take a toll. If you've never been on a bike, you try it in the middle of summer or the middle of winter. If you ride, you know what we mean. We realize it's got to be that much harder on a pig too. If you are interested in the steps we took to get our dog safe, who yes also rides please visit the Questions and Answer page about Biker Dogs. We ride much slower as a pack with her than without her, we have adapted to what is comfortable for her. The windshield is on the bike to limit the amount of air up her snout. Doggles aka Piggles are worn to protect the eyes from objects and to keep them from not drying out. She wears baby sunscreen on her body and face. She sometimes wears a head sock, this functions as a protector from the wind, limiting the wind sound that might be going into her ears. We use it on longer rides. She wears loose light color shirts, yes somethings in the summer too, to keep the sun off her, however the clothing is cut loose at the arm pits, this spot helps regulate their heat. We take lots of road breaks, a lot. Still need to know or see more? Follow me on Facebook and don't be afraid to ask any quesitons!